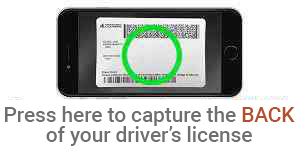 Take a picture of the BACK of your driver's license. If you are using a Passport or Government ID, close this window to continue. By clicking on "I agree", you promise that everything you have stated in this application is correct to the best of your knowledge and that you have provided a complete listing of everything you owe. If there are any important changes you will notify us immediately in writing. You authorize Achieve Financial Credit Union to obtain credit reports in connection with this application for credit and for any update, increase, renewal, extension or collection of the credit received. You understand that the Credit Union will rely on the information in this application and your credit report to make its decision. If you request, the Credit Union will tell you the name and address of any credit bureau from which it received a credit report for you. It is a federal crime to willfully and deliberately provide incomplete or incorrect information on loan applications made to federal Credit Unions or state chartered Credit Unions insured by the National Credit Union Administration. We're sorry you have opted not to use our automated prequalification system for your application. Please call us at 860-828-2790 option 2 and a loan representative will be happy to assist you.